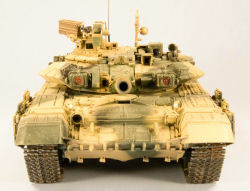 Russian and Soviet tank modelers have long awaited a good T-72 type tank model and Zvezda has finally answered their prayers with their new T-90 kit (No. 3573). 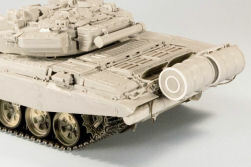 While it actually builds up to a pretty good model of the T-90A Model 1999 tank with welded turret, the chassis could be used as a base for a good T-72 model. Its one major factor to be fixed is removing the second shock absorber assembly from road wheel station 2 on each side to backdate it to a T-72 lower hull. Overall I have to state up front this is the best fitting model I have built in years, and if properly cleaned up the parts fit perfectly with no fighting or hassle to get them into place. 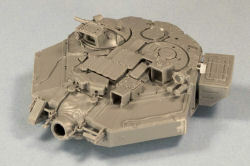 But it is like a Tristar kit in that the modeler has to clean up each part perfectly; unlike Tamiya kits no slop or sprue burrs can be permitted. 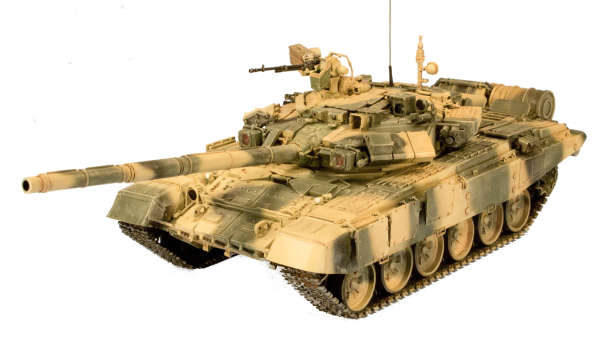 Due to the amazing complexity of the T-90 series tanks – and the fact that unless you have studied the 20 year evolution of the tank – many of the parts are confusing or unknown, I’ll call them out as assemblies as we go through. The main thing with this tank is that it uses the “Shtora-1” active protection system that combines smoke grenade launchers, laser warning sensors, and infrared disrupting searchlights to interfere with antitank missile tracking sights into a single interactive package. The Zvezda kit faithfully replicates that here. 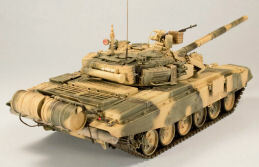 It also comes with the “Kontakt-5” built-in explosive reactive armor array, the 1EhTs29 commander’s station, a 125mm 2A46M5 improved gun, the heat suppressed V-92S2 engine exhaust, and UMSh “live” universal track system. There are 35 steps to its assembly, and I followed most of them in order. Zvezda’s directions have subassemblies prepared first on the left side of the direction pages, and then used to assemble components in the steps on the right side of the page. Each subassembly is keyed to the step opposite it. 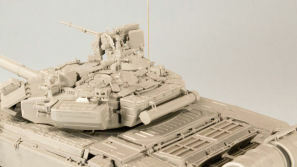 Steps 1 to 6 cover the assembly of the basic turret and initial installation of the “Shtora” system elements. It also provides for the commander’s TKN-4S sight (parts E13, F9, F48, F104, F115) and the “Agava-2” gunner’s thermal sight (E4, F100, F151). The latter may be shown open with clear lens or closed. The tank also comes with the standard 1G46 sight (E7, F34) as well. The turret is not formally assembled until Step 6 as the base of the 1EhTs29 cupola and other hatches and sights must be added first. The cupola may be made to swivel within its limits (the real one has a lot of cables and cannot swing 360 degrees, only about 200) and both hatches may be made to open. I cemented mine closed. After installing the “Shtora” forward bits the next items are the turret reactive armor arrays, control boxes for the searchlights, and all of the ZIP bins. This happens in Step 13. Steps 14-15 are the preliminary steps to mount the NVST machine gun on the 1EhTs29 cupola. 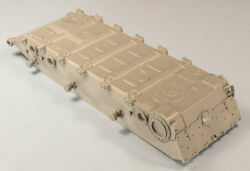 Nearly all of the first production lot of kits were missing part F103, which is the inside casing for the motor drive to the machine gun mount. 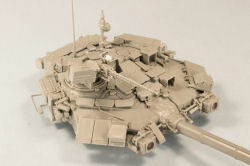 I scratchbuilt one from .040”, .020” and .010” styrene, and then assembled the entire machine gun mount together. Step 16 is the gun barrel assembly and is just two parts. I used a Flex-I-File to sand down the seams and trimmed them up with a “mousetail” file. 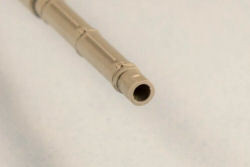 Note that the flat spot on the muzzle goes up as it is integral to aligning the barrel during installation. Also the 2A46M5 has a necked-down area behind the muzzle crown for installing the receiver unit of a muzzle reference system (now being installed on Russian tanks) but the kit has the gun but not the system. For that reason the barrel closing flanges are offset to the right, so the kit is correct. With Step 18 the turret is basically finished. 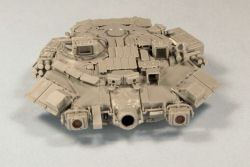 There are a total of 199 parts allocated to the turret but about 8 of them are optional covers so will be left over bits. Hull assembly starts with Step 19 and the engine grilles. I tossed the nylon screening the kit comes with and replaced it with On the Mark Models stainless steel diamond pattern screen. Also the exhaust assembly (Steps 19a, b, c) are installed. This is followed in Step 20 by the fuel tanks, fender ZIP bins, upper rubber screening, and driver’s hatch. Step 21 starts the lower hull and once again this needed zero putty. I did cement all four parts together at once for stability and fit rather than wait two steps for the stern plate (C10). I also used the OTTM stainless grilles on the radiator air exhaust (F40) rather than the other section of screening. The suspension arms (parts D29) are VERY fragile and shear off easily, so be careful. The ones which connect to the lever action shock arms (D33, D63) are easier to lock in place. Road wheels go on in Step 25, but I cemented the complete drivers and idlers in place at this time so I could accurately position the tracks. The tracks are magnificent – six sections cover the entire run and fit perfectly. For some reason (diehards I guess) Zvezda provides eight single links but unless you screw up or want to wrap the tracks your way they are unnecessary. At this stage I painted the road wheels and outer sections of the lower hull, tracks and undersides of the fenders. 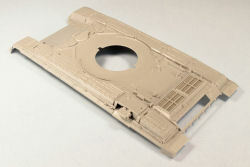 After assembling the painted wheels and weathering the tracks a bit, I then cemented the hull haves together. In Step 29 I replaced the string with twisted steel wires for the tow cables. The unditching log (B4, B5, D29) was scraped with a razor saw to distress it and then sanded down to remove the burrs. The rest just clicked along until I hit Step 33-34. For some reason, this is the only major goof in the entire kit. Zvezda provided a top to the auxiliary fuel tanks (fuel drums) with a fitting which was okay, but the bases are flat and smooth and lack reinforcing rings. I added these from .020” square strip and thin sections of styrene tubing. They were then sanded down and installed. Note that on my kit the piping for the auxiliary fuel tanks (F141, F143, D8, F142, F137) all fit perfectly. 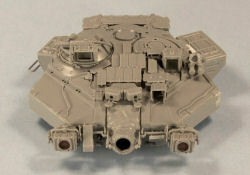 With the installation of the last few parts and forward side reactive armor panels the model was complete. I decided to remove and replace the kit’s styrene antenna (C17) with one made from .015” brass wire. The model was then finished using Floquil enamels – Aged Concrete, Pullman Green, and Engine Black, which are close to some of the color combinations used by the Russians. 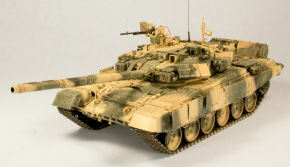 I did not weather the model heavily as the T-90As are “Cadillac” tanks and well maintained right now as the flagship vehicle of the Russian Army. I had a hard time nailing down a specific unit and markings for these tanks (as there are so few of them in service – so far only about 700 T-90s of all types have been built for the Russian Army) but finally found a unit doing gunnery training. I therefore marked it for the 18th Independent Motorized Rifle Brigade in the Caucasus last year (2011). They have unit insignia and the “bort” or side numbers on the left ZIP bin and oddly enough the rear one, but not the right. (Other locations include the reactive armor arrays but these are on “demo” vehicles as near as I can tell). Note that the searchlights on the “Shtora” system glow orange when viewed from the front. I used exposed film with silver paint backing to create that impression on the model and it is visible when looked at from dead ahead. Overall this is a wonderful model and a challenge to assemble, but as everything except the errant Part F103 fits right, it is not a major task.